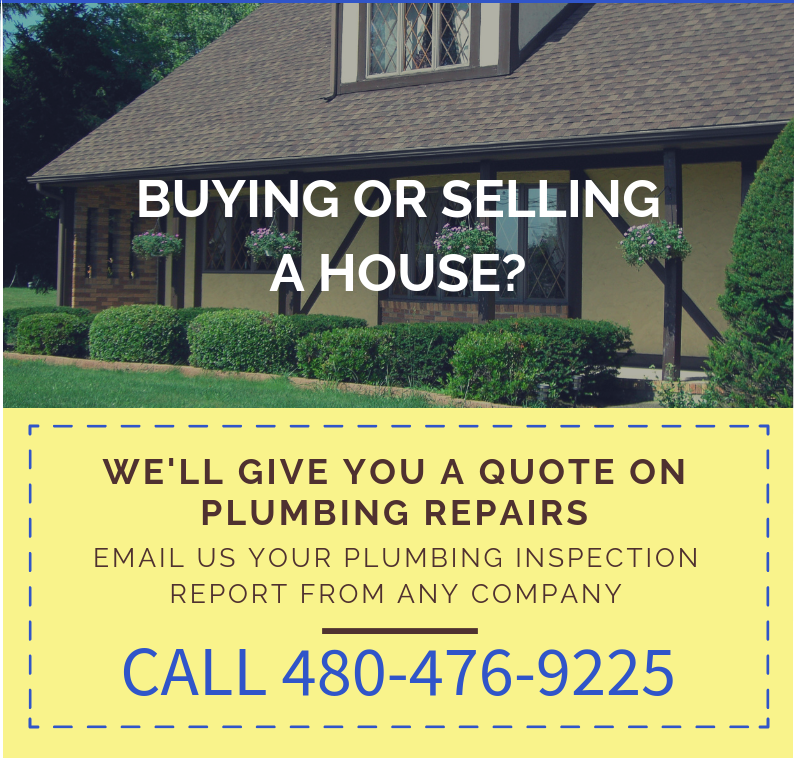 If you are buying or selling a house, email us your plumbing inspection from any company and we will give you a quote on plumbing repair. 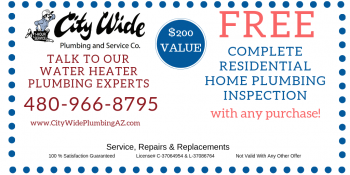 City Wide Plumbing: Your local Tempe, Arizona plumbing company. We're proud to be family owned and operated. When quality counts, choose City Wide Plumbing! We truly can take care of all your plumbing needs! Have questions or want to schedule a visit from one of our trustworthy plumbers? If you’d like a plumbing appointment, we would be happy to help. Whether you need service or installation, we can help you with any and all of your plumbing needs. Homeowners often call a plumber when they have a problem – and we know how valuable your time is! 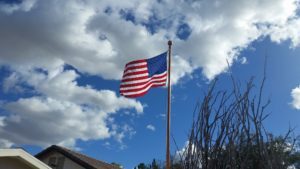 Our licensed professionals are ready to help – and they get the job done right. We install and service sinks, toilets, bathtubs, showers, garbage disposals, hot water heaters, and more! When it comes to a commercial plumbing project or repair, businesses need to have quick, trustworthy service. 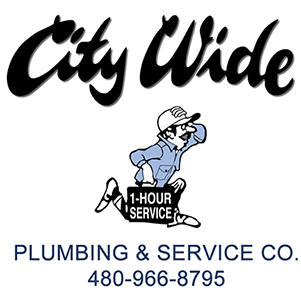 City Wide Plumbing has the expertise you can count on. We’ll get the job done in timely fashion, and get it right the first time – so your business can keep on doing what it needs to do. When your water heater wears out, goes on strike, or quits completely, it can be a mess! Contact City Wide Plumbers to get your hot water back on tap TODAY. In many cases, we can be there within the hour. You can count on us! I had a bathtub issue that I couldn't resolve. I gave up and went immediately to Yelp. After seeing their high reviews I gave them a call. The phone barely rang twice and I got someone on the phone to explain my issue. Immediately, she had me scheduled the next day btwn 12-1:00 pm. I got a call at 11:45 saying my plumber was on their way. At 12:01 my plumber showed up. Polite....handed me a card and shook my hand. I showed/explained my problem. He took one look at it...and in less than 10 seconds he told me the price and said no problem. Well...30 min later I was up and running and I was pleased by the workmanship and very reasonable price. Use these guys. Seriously......there is a reason they are ranked so high on Yelp. I hope I don't need another plumber for some time but if I do.....I will gladly give them a call. I had David from CityWide plumbing out to my home to clear a clogged kitchen sink. He was very knowledgable and gave me some good tips of how to prevent the clogging from happening again. Before he left, he tested the disposal and other water lines to make sure I was good to go. Replaced water heater under warranty. Done on day called. Plumber was very pleasant. Person on phone at office outstanding. Our compliments to owner! Highly recommend. He gave me a rough, reasonable cost estimate before beginning, and came in a couple dollars below it. I had a leak in the seal of an upstairs toilet causing water to drip onto the ceiling downstairs. I called another company and they told me it would take a week to send someone out. I called City Wide and Robert showed up at my door within 2 hours and had the problem fixed within 30 minutes. Both Robert and the office staff were a pleasure to work with. They are very professional and you can tell they care about their customers. I was given a fair price and an additional discount for being a first time customer. Highly recommended for any plumbing needs. Most of us don’t appreciate a toilet until it stops working correctly. But oh, when it does – what a hassle! If you have a toilet problem, we understand you don’t have time to wait. Our pros can get the job done right, and quickly. We depend on running water in our homes, and faucet troubles can be a real pain. 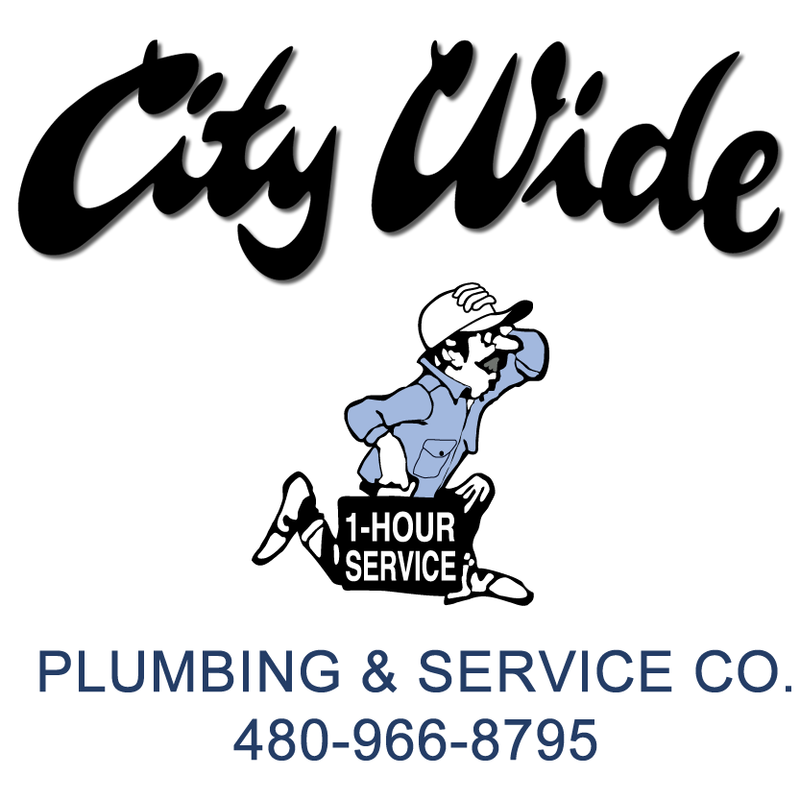 Whether you need repair or new installation, City Wide Plumbing is ready to tackle the project. 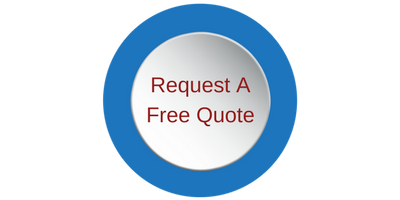 We know you’ll be pleased with our friendly and reliable service. Let’s get started!